I’m having a hard time getting restarted with my writing here on this blog. I suppose it’s because not much happens in my life on a day-to-day basis. Working full-time with a long commute, my weekdays consist mostly of driving, working and driving back home again – just to give you a short summary. In between I feed the cats, tend my chickens and try to make order out of the chaos that is my home. But everyday begins much the same with me stumbling out of bed directly to my coffeemaker and in that morning haze I prepare a pot of coffee for brewing. This part of my day is by far my most enjoyable and I must boast that I make the very best cup of coffee this side of the Mississippi. After years of experimenting with this expensive coffee and that less expensive coffee, I’ve discovered the “gold standard” in my home-brew, coffee-making world and oh that first sip of steaming, aromatic coffee with a touch of cream… delicious… comforting… addictive! Once my caffeine fix has been satisfied my day is underway and full-on. If my Monday through Friday schedule allows me a quick minute to sketch, paint or write it will be only that … a quick minute. Feeling rushed, pushed and pulled away from the very things I really want to do can be frustrating and that frustration has lead to a bout of deep despair. But despair cannot hold a candle to doing… doing something… doing anything… putting paint on canvas… making a mark… writing a word… all of these things possess the power to banish despair and melancholy and I’ll need to remember that everyday after my first cup of coffee! MY COFFEE BREWING SECRET REVEALED: It might surprise you to hear that … drum roll please… Eight O’Clock Coffee (whole bean ground fresh each morning) added to pure spring water equals perfection! 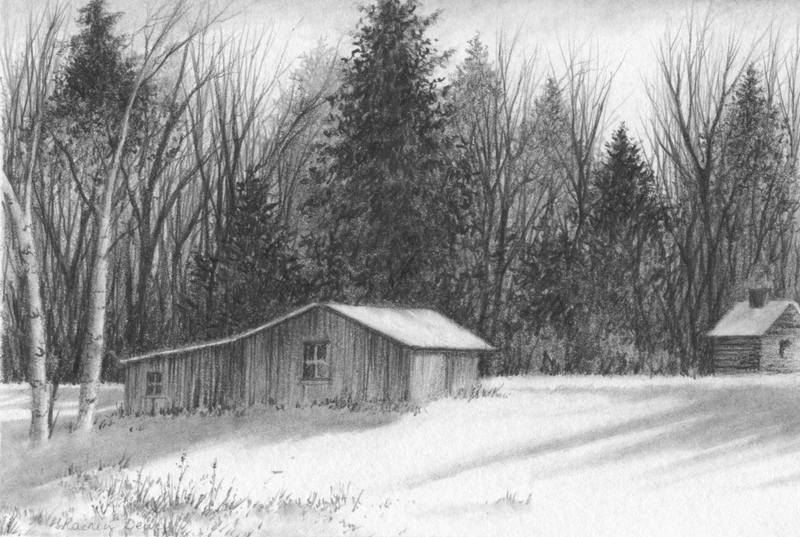 “Old Shed” Graphite on Bristol – This drawing is one of a half dozen or so that I’m trying to finish by a “making a mark” each morning before work! 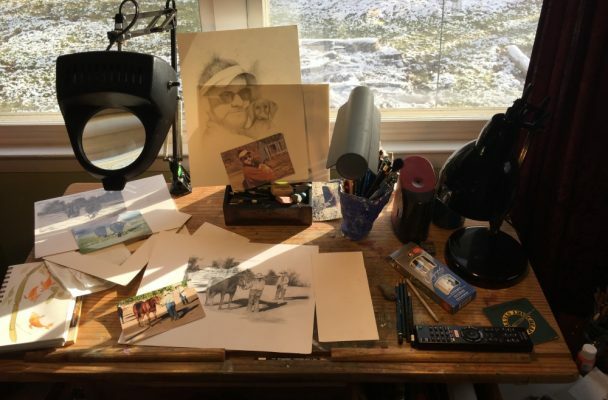 On my art desk above you’ll see a few other sketches in various stages of incompleteness… those too I will finish… I’m determined!